Red Wings Airlines (Moscow-Vnukovo) as planned, took delivery of its first Superjet 100 this month. On January 19 the company accepted the pictured former Moskovia Airlines Superjet 100-95B registered as RA-89021 (msn 95021). The new type is being leased from Sukhoi and two more copies will follow. This entry was posted in Red Wings Airlines and tagged 95021, RA-89021, Red Wings, Red Wings Airlines, Sukhoi, Sukhoi SuperJet, Sukhoi Superjet 100-95B, SuperJet, Superjet 100, Superjet 100-95B on January 26, 2015 by Bruce Drum. Red Wings Airlines (Moscow) has announced it has opened the sale of tickets for the Moscow-Grozny route. Flights will be operated from January 2 to March 28, 2015 with newly acquired Sukhoi Superjet 100s. 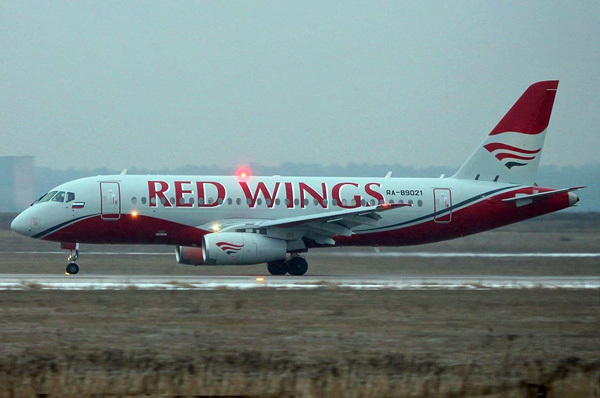 Red Wings Airlines selected the Sukhoi Superjet 100 on October 8, 2014 and signed a contract to lease the three Sukhoi Superjet 100 aircraft from Sukhoi. The aircraft will be handed over to the airline before the end of the 2014 season. Red Wings plans to fly the Sukhoi Superjet 100 from Moscow also to Ufa, Sochi, Chelyabinsk and Makhachkala. According to ch-aviation Red Wings is to take delivery of the former Moskovia Airlines aircraft starting this month. RA-89001 (msn 95008) and RA-89021 (msn 95021) (above) are scheduled to arrive on or after December 22 with RA-89002 (msn 95002) set to follow in March 2015 according to ch-aviation. This entry was posted in Red Wings Airlines and tagged 95021, RA-89021, Red Wings, Red Wings Airlines, Sukhoi, Sukhoi SuperJet, Sukhoi Superjet 100, Sukhoi Superjet 100-95B, SuperJet, Superjet 100-95B on December 14, 2014 by Bruce Drum. Red Wings Airlines‘ (Moscow-Vnukovo) Air Operators Certificate (AOC) has been recertified and the carrier has relaunched operations. Federal Air Transport Agency has renewed the certificate of the operator Red Wings to carry commercial passengers and freight. The airline since it was grounded, has added a new CEO. Red Wings has conducted a revision of its aircraft crew training, as well as to address the deficiencies and violations found during the unscheduled inspections at the beginning of this year. Together, the common set of measures taken has allowed Red Wings to provide proof of its readiness to continue its activities. 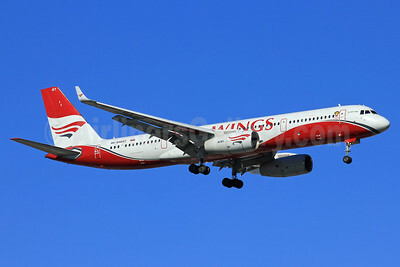 In this regard, the Federal Air Transport Agency has positively reviewed the application of Red Wings for the resumption of its business and commercial passenger and freight traffic from June 17, 2013. The airline has resumed operations with two Tupolev Tu-204s. Previously the Russian carrier was ground in February 2013 following the crash of flight 9268 with RA-64047 on December 29, 2012 in Moscow. Copyright Photo: Paul Denton/AirlinersGallery.com. Tupolev Tu-204-100V RA-64043 (msn 1450743164043) prepares to land at the vacation destination of Antalya, Turkey. This entry was posted in Red Wings Airlines and tagged 1450743164043, Antalya, aviation, AYT, moscow vnukovo, RA64043, Red Wings, Red Wings Airlines, transportation, Tu204, Tu204100, Tu204100V, Tupolev, Tupolev Tu204, Tupolev Tu204100 on June 27, 2013 by Bruce Drum. On February 4, 2013 the Federal Air Transport Agency of Russia (Rosaviatsia) suspended the Air Operators Certificate (AOC) of our airline. 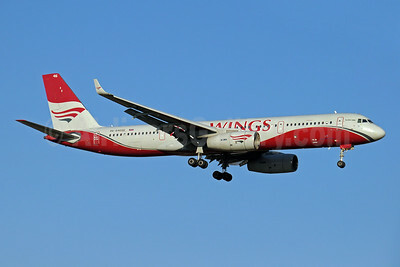 The decision was made ​​based on the inspection of the airline from 10 to January 10-16, 2013. According to the Federal Air Transport Agency, published on their official website, they have been found “numerous significant violations in the organization of flight operations, aircraft maintenance, pilot training and other shortcomings in the airline with systemic problems.” The December 29, 2012 crash is not the cause of the suspension of our airline. The Commission concluded that Red Wings continues to meet certification requirements. On December 28, 2012 Rostransnadzor completed an audit of our company. The audit identified 18 comments, 2 of them removed during the test. At the moment, the audit removed another 10 comments, of which 6 are being addressed. None of the comments did not prevent the further work of the company. It should also be noted that the airline has not yet received an official certificate from the Federal Air Transport Agency of the unscheduled inspection on the basis of which the decision was taken to suspend the AOC. Once the document is received, the company intends to respond promptly to all complaints of the aviation authority to resume flight operations. Copyright Photo: Paul Denton. Tupolev Tu-204-100 RA-64019 (msn 1450743164019) lines up to land at Antalya, Turkey. This entry was posted in Red Wings Airlines and tagged 1450743164019, Antalya, aviation, AYT, RA64019, Red Wings, Red Wings Airlines, transportation, Tu204, Tu204100, Tupolev, Tupolev Tu204, Tupolev Tu204100 on February 4, 2013 by Bruce Drum. Red Wings Airlines‘ (Moscow-Vnukovo) Tupolev Tu-204-100B RA-64047 (msn 1450743164047) crashed today (December 29) while landing at its home base of Vnukovo on a non-revenue flight. RA-64047 was being operated as ferry flight RWZ 9268. The jetliner ran off the end of the runway on landing, crashed into the side of the adjacent roadway (see video below), broke up and caught on fire killing at least four people of the eight on board according to this report by Global News. Copyright Photo: Eurospot. RA-64047 is pictured on final approach to Antalya prior to the tragic crash. This entry was posted in Red Wings Airlines and tagged 1450743164047, Antalya, AYT, moscow vnukovo, RA64047, Red Wings, Red Wings Airlines, tragic crash, transportation, Tu204, Tu204100, Tu204100B, Tupolev, Tupolev Tu204, Tupolev Tu204100 on December 29, 2012 by Bruce Drum. 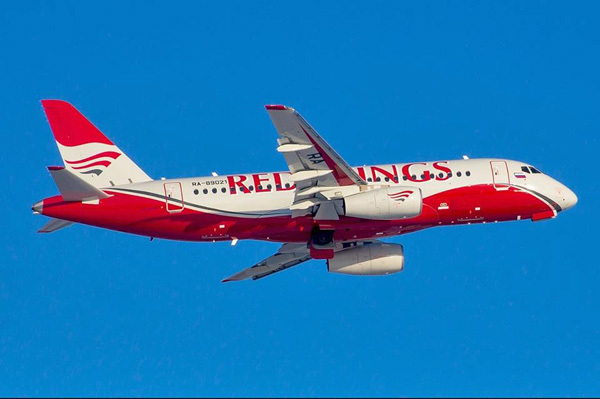 Red Wings Airlines (Moscow-Vnukovo) will open up regularly scheduled flights from Moscow (Vnukovo) to Ekaterinburg (Koltsovo) starting on August 27. Flights will be operated Monday through Friday. Departure from Moscow at 4 pm (1600) and from Koltsovo at 9:40 pm (2140). Yekaterinburg is the fourth-largest city in Russia with a population of nearly 1.4 million people. The city is situated in the middle of the Eurasian continent, on the border of Europe and Asia. Copyright Photo: Paul Denton. Red Wings is the largest operator of the Tupolev Tu-204. Tu-204-100B RA-64046 completes its final approach into Antalya, Turkey. This entry was posted in Red Wings Airlines and tagged 1450743164046, Antalya, aviation, AYT, RA64046, Red Wings, Red Wings Airlines, transportation, travel, Tu204, Tu204100, Tu204100B, Tupolev, Tupolev Tu204, Tupolev Tu204100 on August 7, 2012 by Bruce Drum. Red Wings Airlines Tupolev Tu-204-100 RA-64019 (msn 1450743164019) AYT (Ton Jochems), originally uploaded by Airliners Gallery. Red Wings Airlines (Moscow) is considering setting up a new base in Makhachkala, Dagestan with new service to Moscow and other destinations. The Dagestan region is now under served due to the recent demis of Dagestan Airlines (South East Airlines). The Republic of Dagestan, also spelled Daghestan, is a federal republic of Russia, located in the North Caucasus region. Its capital and the largest city is Makhachkala, located at the center of Dagestan on the Caspian Sea. Copyright Photo: Ton Jochems. Please click on the photo for information on this carrier. This entry was posted in Red Wings Airlines and tagged Red Wings Airlines on January 23, 2012 by Bruce Drum.